Occasionally, I will run across something that is surprisingly likable. That means, really, that I am surprised that I actually like it. 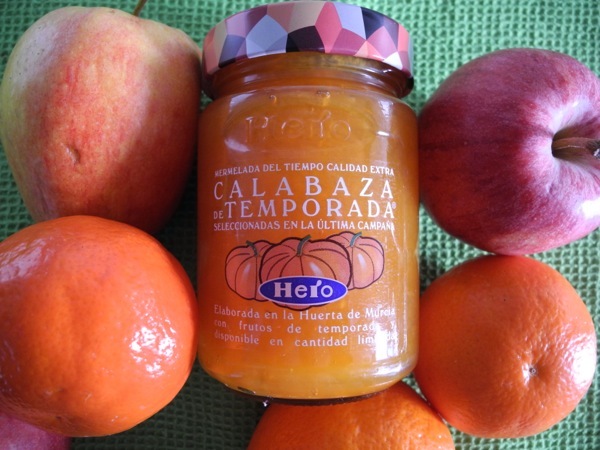 Today’s post is one of those surprises: the Calabaza. The pronunciation here is with the Spanish “th” where the “z” is placed, so it rolls off the tongue as “calaBAtha,” a word that you could perhaps slip into your daily conversation. This vegetable can be made into savory or sweet dishes. I have had it in a scalloped “sweet potato” casserole in place of the potatoes, in a burrito, in a purée in place of a tomato sauce with a flavorful cheese as a perfect complement, as a baked half-pumpkin purchased at a local horno that cooks take-away meals, and in my latest find: Calabaza marmelade. When I saw it on the shelf at the grocery store, I knew it had to be mine. I was right… this stuff is amazing. 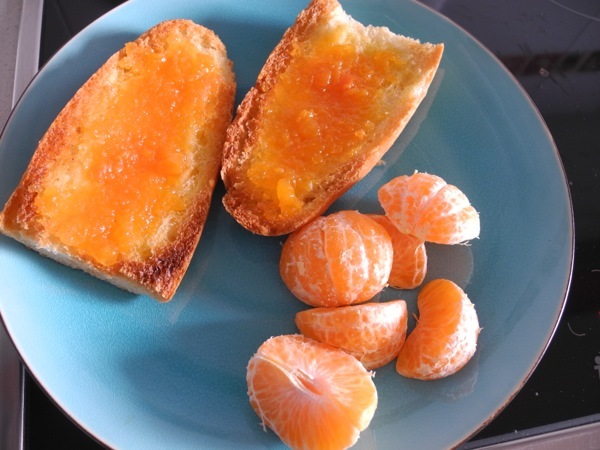 On toast complemented by sweet mandarinas, I hit the breakfast jackpot. P.S. I dare you to say calabaza to someone in the next 10 minutes. If you leave a comment, mention calabaza and it will be a special moment between us. Seriously. I like pumpkin pie but never thought it could look so yummy on toast. I’ll look for calaza in Georgia. Have a great day Chris. Looks delicious. Wish I was there having some Calabaza instead of looking at how much ice is accumulating on my trees! Miss you Christopher. >Wink< Oh, my, after watching the weather reports there, I am a little glad to be over here. While I know the crazy traffic was horrible a couple of weeks ago, I still am glad that there was a "warning shot" from the weather system to make this storm appear very, very serious. I hope everyone is being safe and staying warm! Miss you, too, Janice! Besos! I had Calabaza en Tacha years ago while in Mexico, and you’re right it’s versatile and delicious! >Wink< I just looked that up, and I may have to add that to the things I am going to cook with calabaza next week. Dang! That sure looks tasty! At first glance I thought you were going to be writing about Calabozo (Venezuela). I’ve been there. 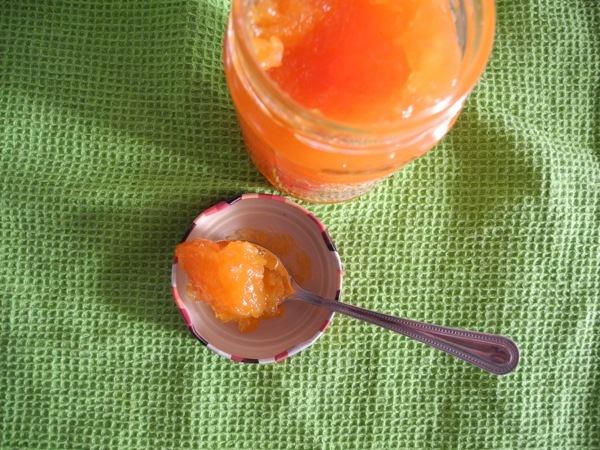 But introducing me to a new vegetable that can be turned into a delicious marmalade is excellent too! Would love to try the deliciousness. >Wink< Oh, my, Christa, the food here in general is amazing. Plus, there are markets all over the place where fresh produce is readily available. Pretty awesome! Hey Christopher, I’m hoping to have calabaza this summer during my visit to Barcelona. Take care and I’m glad you are well. Calabaza is delicious! they made it ASV as a soup and it was my favorite lunch. To me is is very much like butternut squash in color and taste. So now I make the soup here all the time! Hope you are enjoying Valencia and its charms! I miss it a lot! Are you working there? I agree, it is very like butternut squash, although it is not exactly the same. I actually found a recipe for “candied calabaza” that I might try toward Thanksgiving… you never know!